Ahead of a winter storm expected to reach Newtown today, Newtown Public Schools announced Monday evening that all classes would be canceled for Tuesday, February 12. CT Woolcrafters had also announced on Monday that their February 12 meeting would be postponed one week, to Tuesday, February 19. Tuesday morning, C.H. Booth Library announced it would be closed for the day. All scheduled events at the library are canceled for the day. The National Weather Service says snow and sleet will reach southern Connecticut this morning, before transitioning to freezing rain and sleet late morning into afternoon. There will be a gradual transition to plain rain from south to north by the evening. 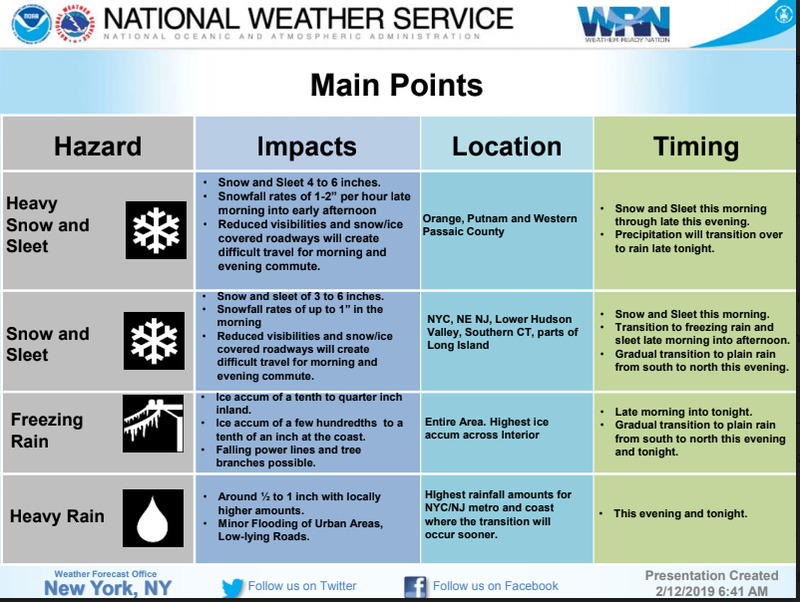 Accumulations of snow and sleet could reach 3-6 inches, according to the weather service. Snow could fall at a rate of 1-inch per hour this morning, creating reduced visibilities. Snow and ice covered roads will create difficult travel for morning and evening commute, also according to NWS. Readers are reminded that groups, businesses, organizations, et al who need to announce closings or other changes of plans are invited to contact The Newtown Bee with that information. Associate Editor Shannon Hicks can be reached at 203-426-3141 or shannon@thebee.com. Announcements will be added to this story and posted on our Facebook and Twitter pages as they are received. EverWonder Children's Museum is closed today. FAITH Food Pantry will be closed today. Volunteers plan to be back at 46 Church Hill Road for their next scheduled opening, Thursday, February 14, 6 to 7:30 pm. Castle Hill Chocolate will be opening at 10 am today, but may close early, according to Owner & Chocolatier Erica Sullivan. "We recommend that folks stop in early for their valentine's chocolate," she said. Newtown Youth & Family Services has announced it will close at 1:30 this afternoon. All Parks & Recreation activities have been canceled for today. Tennis at NYA has also been canceled; a make-up date will be determined. The Resiliency Center of Newtown is closed today. Team members can be reached via email. Tonight's Parks & Recreation Commission meeting has been canceled. The recently opened Strength & Grace Boutique, on Church Hill Road in Sandy Hook Center, has announced it will be closing at 2 o'clock today. UPDATE (1:29 pm): Strength & Grace Boutique moved up its closing time to noon. Newtown Municipal Center and all Town offices will be closing at 1 pm. Edmond Town Hall will close at 1 pm today, and today's matinee and evening screenings of Becoming Astrid have been canceled. The ETH Board of Managers Personnel Subcommittee meeting and regular board meeting have also been canceled. Dere Street Restaurant & Bar will be closed this evening for dinner.